Annie's Art Book: Chicken drums( drumsticks) for busy mums! 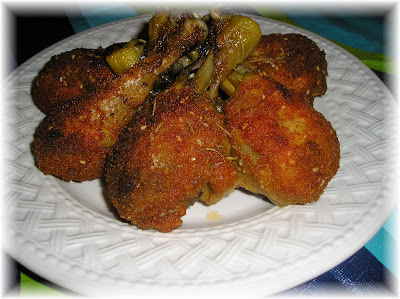 Wash the chicken drumsticks and put them in a pan filled with cold water. Bring the water to boil and boil the chicken until medium cooked. Take them out of the water and place them on paper to dry a little bit. Preheat the oven at 375F and melt 8 tablespoons of butter in a cup. Mix the herbs and spices with the breadcrumbs. Take one drumstick at a time and dip it in the melted butter ( the butter has to be liquid, not just softened), then take it out and roll it over the breadcrumbs mixture. Place on a parchment paper in a cooking pan. Bake until crispy on top ( around 25-30 minutes).